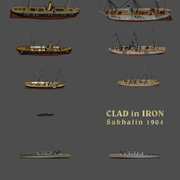 Dear Sirs or Madams, it's time to open a topic on the progress of work on creating a new scenario for our "Ironclads/Clad in Iron" naval series. 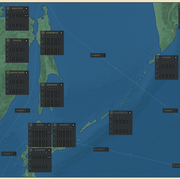 This time we will apply our strength to the game of the Russo-Japanese War of 1904-1905. Considering our capabilities, we realized that we could not show the grand events of the siege of Port Arthur, the battle in the Yellow Sea and the Tsushima battle. Therefore, we chose a different theater of hostilities - the events on Sakhalin, the Kuril Islands and Kamchatka. 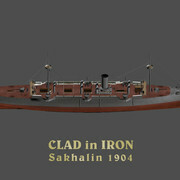 Sakhalin Island was the main battlefield in those places, and therefore we called the new game "Clad in Iron: Sakhalin 1904". If there are no problems, the game will be released on November 5th. 1. SIM mode. Russian and Japanese armored cruisers. 2. TBS mode. New building for the defense of the harbor - the base of submarines. 3. TBS mode. The division of all the harbors in the shallow and deep. Now, large ships will not be able to enter the shallow harbor. 4. TBS mode. The probability of a ship undermining a minefield depends on its size. 5. TBS mode. The probability of a successful attack of a submarine depends on the size of the target. 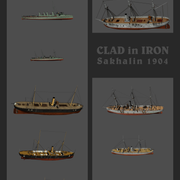 Imperial Japanese Navy Naniwa-class protected cruisers - coming soon in CLAD in IRON: Sakhalin 1904. Join us for the Steam Lunar New Year Sale. Offer ends 11 February. 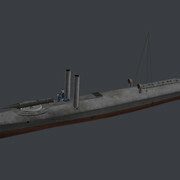 We will soon add a new type of ship to the game.